4,000 words and phrases are organized thematically within 163 topics. Includes English to Spanish translations of vocabulary throughout, and an extensive index in Spanish at the back of the book.A fully integrated vocabulary development program in American English, progressing from essential words to the more complex, delivered in short thematic units. Realistic scenarios and modern artwork are easy to relate to and these, together with story pages and practice exercises, have been applauded for their success in promoting critical thinking skills. Content is fully supported by a range of components (in English only) - including Workbooks, Classroom Activities, Audio and website. 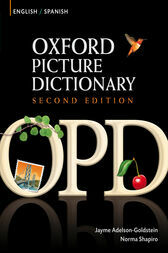 Title: Oxford Picture Dictionary English-Spanish Edition: Bilingual Dictionary for Spanish-speaking teenage and adult students of English.